CAN OFFICER ROSE GET THE DRUG LORD AND SAVE AARON IN THE PROCESS?? THIS IS A MUST READ AND OMG YOU HAVE TO READ IT!! I was gifted with a copy of this book from the author Adele R. N. in exchange for an honest opinion. This is Mismousey’s very honest opinion, of her very delectable and intriguing book. Upon opening her book and starting to read it- the author is able to capture you and draw right in to her web of weaving. Her writing is so magnificent – The way that this wonderful author is able to bring a crime and love with each together is pure genius. 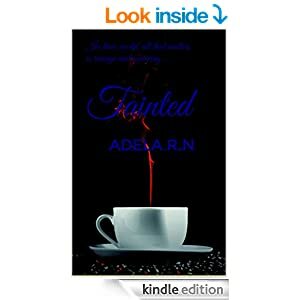 The cover of this amazing book has been crafted so creatively – it makes you want to read the book “TAINTED”, and as for the blurb well that draws you into the storyline so much more. Here you have a story about a cop named Rose and man named Aaron who wants out of the drug world before he starts killing. He has done everything that has been asked of him and he is afraid that he will soon be asked to start whacking people off. He has one big plan before he gets out and that is to rip off both of his bosses making them think that the other did the job. The night Aarons his plan goes down it turns out bad. Officer Rose has been told not to go out alone into the projects but she doesn’t listen. She hears a noise and goes to investigate it bullets start flying everywhere and her gun goes missing. Before the night is over Aaron is in her protective custody and she is hiding him from 2 different crime lords. Will she be able to keep him safe?? What happens between?? This amazing crime/love story has a twist and turns it. You never know is going to happen next in this couples life. I recommend this book to everyone to read. The author Adela R N has a written a fantastic and terrific story. One that I would love to read more of. This is one book that you would not want to miss reading, Man , you are a genius and please write more about Aaron and Rose !! Now as to MisMousey’s rating – I give this a firm rating of 45 out of 5 stars. This book is one that you will not put down till you have devoured the very last word it. SHe keeps you on the edge of your seat/ page of your book!! NOW WHAT ARE YOU WAITING FOR?? RUN AND GET YOUR COPY TODAY!! ← FORBIDDEN BILLIONAIRE BY J S SCOTT RELEASES JULY 28TH ORDER YOUR COPY TODAY!! !